Who else is addicted to the Bravo/Lifetime fashion shows? As I was uploading these photos, the boyfriend and I were watching a DVR’d episode of It’s a Brad, Brad World when the witty Brad told his assistant to “get your gingham on”. Thank you for the post title, Brad! I love this white blazer, but damn, is it hard to keep clean. I feel like every time I wear it, it’s in need of another dry cleaning. It’s also been suffering from mysterious yellow-orange marks of oxidation that appear out of nowhere. Last time they got cleaned with a “wet cleaning“, and it looks like it may be due for another one. The fear of getting it dirty stops me from wearing this blazer as often as I would like, but that’s gonna have to change this spring. Wearing it today reminded me of how crisp it looks, and how great it pairs with my growing collection of collared shirts. Do you avoid wearing your whites for fear of getting them dirty? Always liked this shirt on you. Looks great withe the jacket. Looks great! I agree that the white jacket looks super crisp and polished; but I can’t imagine trying to keep it clean! 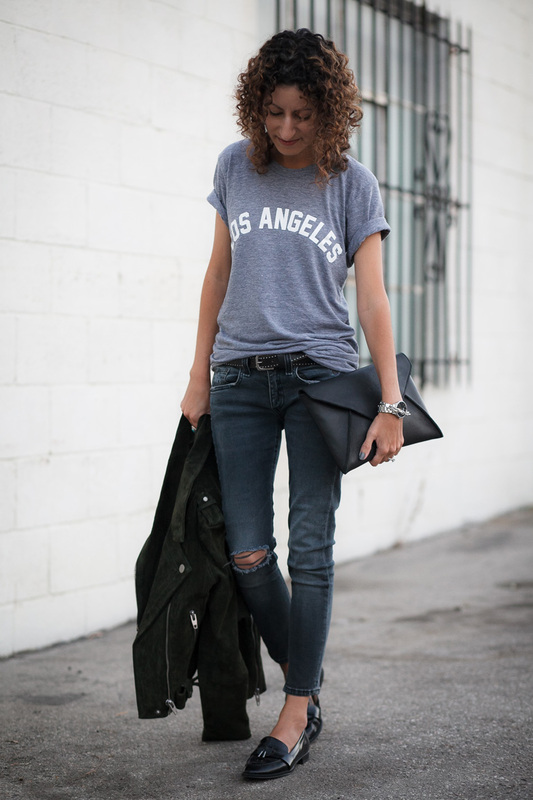 What style of Paige jeans are those? I’m thinking of finally trying a pair, and love how those look. Bummer! Maybe I’ll have to try the leggings. 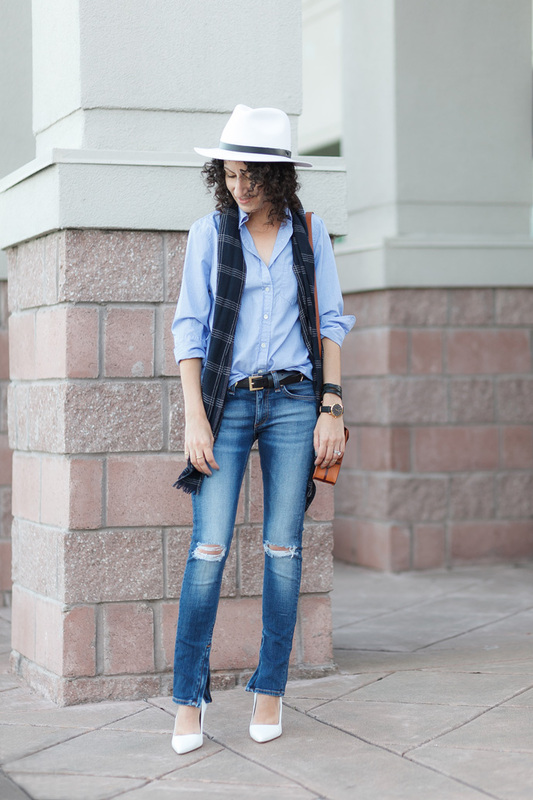 Have you worn/tried the Laurel Canyon? They run small, so a 24 is significantly smaller than it is in other brands. They’re bootcut, so I don’t find myself reaching for them as often as I do my skinnies, but still a viable option! Haha–of course you do! I have two pairs. I wish some of the other styles would run a little smaller. I have been getting skinnies at Wet Seal. I realize that Wet Seal is kind of ten years ago, but the “Fashionista” style has no weird details or brand markings (reminds me a little of JBrand), and the 00 Short needs no alterations for me. By the way, thanks for adding my blog to your blogroll. I really appreciate it and am honored that you read it. Of course! I also added you to the PFC hosting list, but as Petite Sister Style. Are you still interested in hosting? Should I change it to Little Laura’s Closet instead? This looks beautiful!!! Yeah I can’t wear anything white – first off I’m clumsy so something WILL spill on it or I will write on it with red pen or something. Secondly I always wear makeup and no matter what it will get on the collar! Grease spots huh? That makes sense. Do they come out when cleaning your silk shirts? I’ve never had that happen before, but most of my silks are dark colors. On silk, it can be really difficult, but on cotton, it might come out with some dish detergent. Its usually best to get the grease out before the oxidation happens. On silk, it can be really difficult, but on cotton, it might come out with some dish detergent. Its usually best to get the grease out before the oxidation happens. Good luck! Cute look! I absolutely adore winter white and cream coats – but I am afraid to buy one because I know that my makeup will end up on the collar. i’ve been eyeing the purple gingham shirt at jcrew but its just too expensive! 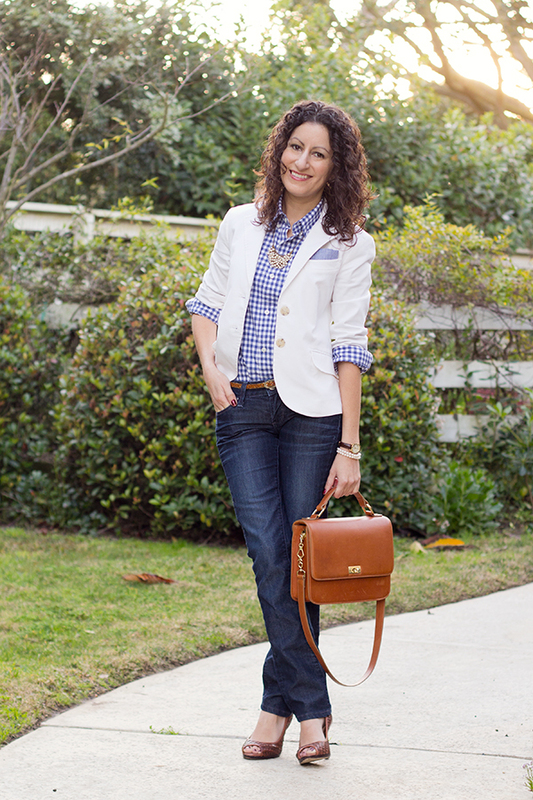 love your blazer! The white blazer, white Jacket, white dress are all sitting neatly in my closet!! Im too scared to try and get them out in this rainy weather!! This is a very clean and crisp outfit! Love it! Oh I can’t wear white as often I would like – I am a stain and ketchup magnet! I love the gingham with the bright white though! 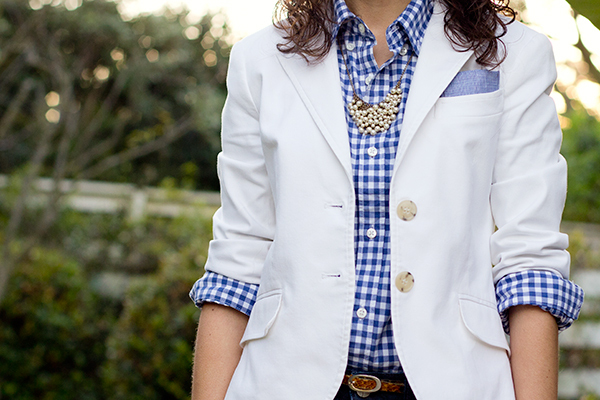 The white blazer is just gorgeous with the crisp blue color on the shirt! It reminds me of those lovely blue and white delft tiles. I bought my first pair of white shorts last spring from ON and wore them all summer, but it was agony — my toddler sees anything white and has a physical NEED to wipe his hands/nose/sand shovel/bubble wand/etc on it about five seconds after I get dressed. Looks like I’ll have to get a fresh pair this season, last year’s is looking awfully grungy. Ugh, I can’t wear anything white. There are these lovely white espadrilles that I’m dying to get for summer but I know I just won’t wear them. I just feel so bad when I see that first smudge, knowing I don’t have the means to get them clean, lol! I have a white sweater I love but hardly wear, and when I do I treat it immediately to prevent those ugly yellow underarm stains! Is that weird? Check your deodorant. The ones that don’t leave white marks on black clothes are probably the culprit. They leave aweful yellow stains on white clothing. I’m in love with this outfit, it suits you well! And yes I’m also guilty of not wearing my whites, mainly because the weather in the Netherlands doesn’t call for whites that often, so when I do where white it makes me very self conscious.